It has been another busy few weeks in the Nursery! We have a lot of exciting events coming up over the next few weeks including World Book Day next Thursday (please see below for further details). I look forward to seeing all the lovely costumes! 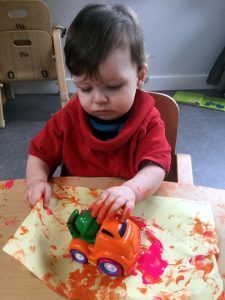 This week in Foals 1, the children have been enjoying mark making with cars. They rolled the cars’ wheels through the paint and watched the marks they made. We encouraged the children to make appropriate sounds while they painted, with the older ones saying “car” and everyone saying “brrrrrrm”! 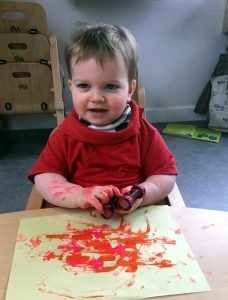 The little ones also explored the feeling of the paint between their hands and fingers and we all got very messy. 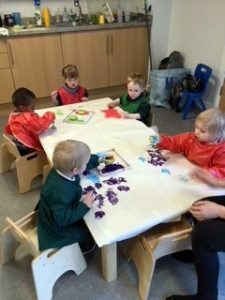 In Foals 2, the children have been particularly enjoying “The Very Hungry Caterpillar” so we incorporated this interest into their learning in different ways. 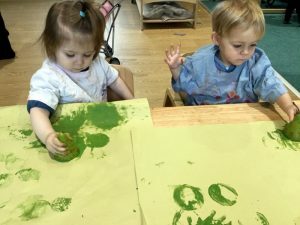 This week, we have been creating artwork by printing using the different fruits eaten by the caterpillar in the book, including apples, pears, strawberries, plums and oranges. Next week we will extend this by tasting foods of different textures and flavours and having more fun to link with World Book Day. In Yearlings, we have enjoyed extending our mark making skills by printing with apples carved into different shapes. We could then talk about the shapes we had made and the colours we had chosen. 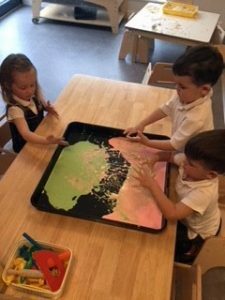 We have also been getting messy this week playing with ‘gloop’ – a mixture of corn flour and water. It has a solid feel when you pat it but flows through your fingers if you scoop it up. 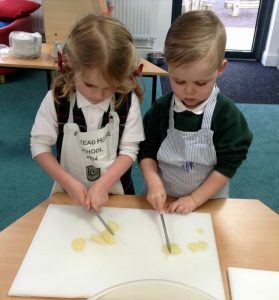 The children greatly enjoyed discovering the different textures of gloop! The children are animatedly enjoying ‘Teamwork Tuesday’. 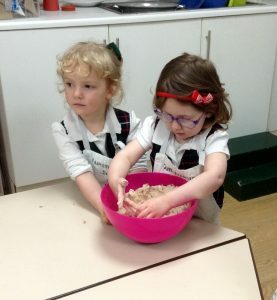 This week, we joined with Reception to work as a team and together we cooked ‘Gruffalo Crumble’. It was delicious! 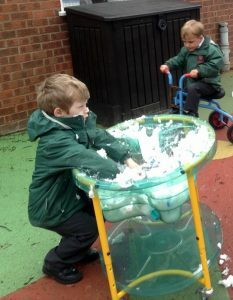 The children also enjoyed imaginative play with white foam (snow) outside. It feels and smells delightful. The Nursery Manager, Mrs Chloe Franklin, is now on maternity leave and Mrs Lucie Melen is the Nursery Manager in her absence. Mrs Felicity Beckett is now Deputy Manager whilst continuing her role as Yearlings Room Leader and Mrs Tracey Diss is the Room Leader in Foals 1. We were delighted to welcome a new member of staff, Miss Carlie Pinkowski, into the Foals 1 Room last week and we hope that she will be very happy as part of the Fairstead House team. There will be a photographer in school taking individual portrait photographs on Wednesday 14th March. The photographer will be Louisa French of Louisa French Photography. 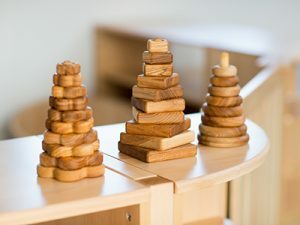 If your child does not normally attend Nursery on that day and you would like your child’s photograph taken, then you will be able to bring your child in during a certain time slot to be photographed. Exact timings have yet to be arranged and we will let you know as soon as we have further details. All Nursery child who attend Nursery on Thursdays are invited to come to Nursery dressed as a literary character from your favourite book. Invitations will shortly be sent out in the post for this very popular event and tickets may be purchased here. I look forward to seeing many of you there!